Dettera's new bar-menu addition, "The Burger." Out with the old, in with the new: Dettera Restaurant and Wine Bar in Ambler, Pennsylvania, hit the "refresh" button today, Jan. 9, with its bar menu, adding 10 new items. 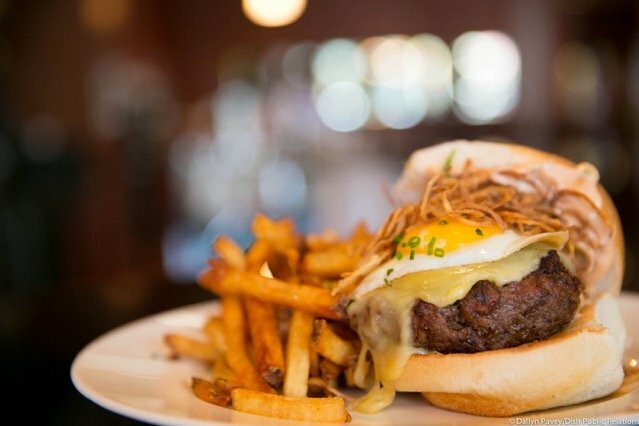 Prime among them is "The Burger," which sounds deceivingly simple in name but contains an 8-ounce sirloin burger with a sunny-side-up egg, crispy fried shallots, Morbier cheese and what the restaurant is ambiguously referring to as a "special sauce." The menu comes courtesy of New American cuisine chef Jeffrey Power, who, according to the Philadelphia Business Journal, was formerly a sous chef at Le Bec Fin. Dettera also announced it will be participating in Ambler Restaurant Week, serving a three-course prix-fixe menu for $35 from Jan. 12-19.